Memories of my high school AP math class. Delicious pie. 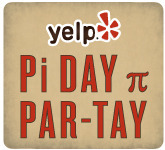 Never before have such a hated topic and such a beloved topic joined quite like they are next week at Yelp’s Pi(e) Day celebration. On 3/14 (get it? 3.14), Yelp is hosting a free (minus the cash bar) event at Pierpont Place, which I think they should temporarily rename Piepont Place, to celebrate all things pie. And what better way to celebrate than by inviting some of Salt Lake’s best pizza pie and dessert pie makers to join forces under one roof for a magical evening of calculating the area of a circle. Oh, and music and free food. And booze. Some of my favorite local places will be slinging slices, such as Sicilia Pizza, Penny Ann’s, and Sweet Home Chicago. RSVP’s are necessary for this party. You can request an invite by clicking here.